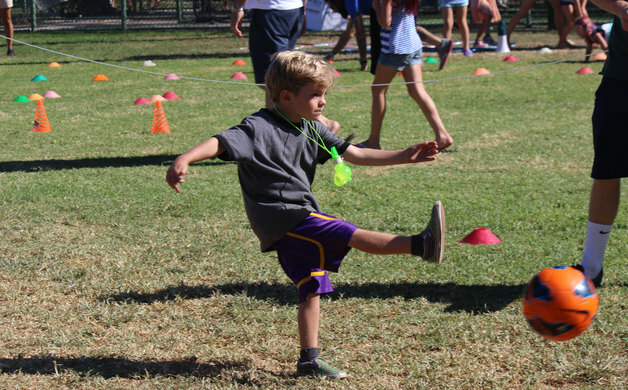 A young boy gives the soccer ball a solid kick during the Manhattan Beach Hometown Fair. Photo by Raquel Gerard. There was definitely a lot of action during the Manhattan Beach 10K Run and the Hometown Fair the first weekend in October. To capture that action, and pay homage to the history and longevity of these two MB events, DigMB held our first photo contest, taking photo submissions from both events in three categories: Cutest Photo, Best Fair Scene/Spirit, and Best Action Shot. We hope the photographers who entered photos enjoyed the contest (and 10K and hometown fair) as much as we did. The submissions spanned the gamut of sights from both events, and we thank everyone who participated, told someone about the contest, and all who've take time to view our wonderful entries. DigMB gives a special thank you to all our prize donors, without whom this contest would not have taken place: Fresh Brothers Pizza - Manhattan Beach, The Original Rinaldi's Manhattan Beach, Simms Restaurants, including Simmzy's - Manhattan Beach, Manhattan Beach Post, Fishing With Dynamite, and Tin Roof Bistro, and musical artist Daddy Roots. Prizes included a $150 gift certificate to any of Simms Restaurants (Simmzy's - Manhattan Beach, Manhattan Beach Post, Fishing With Dynamite, and Tin Roof Bistro), two pizza playdates (valued at $85 each) for eight lucky kids from Fresh Brothers Pizza, two Family Meals (valued at $42.95) each), two $20 gift certificates for The Original Rinaldi's Manhattan Beach, two Simmzy's Summer Series T-Shirts in special Simmzy's mason jar mugs, four "Rainbow Kids" musical CDs by recording artist Daddy Roots, and two Rinaldi's T-shirts. Here are the winners in DigMB's photo contest for "Best Action Shot." 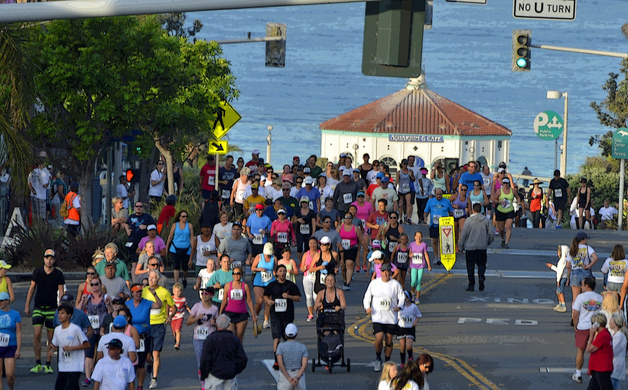 Throngs of runners and walkers make their way along picturesque Manhattan Beach Boulevard during the Manhattan Beach 10K Run. The Roundhouse Marine Studies Lab and Aquarium can be seen prominently at the end of the MB Pier. Photo by Charles Scholz. 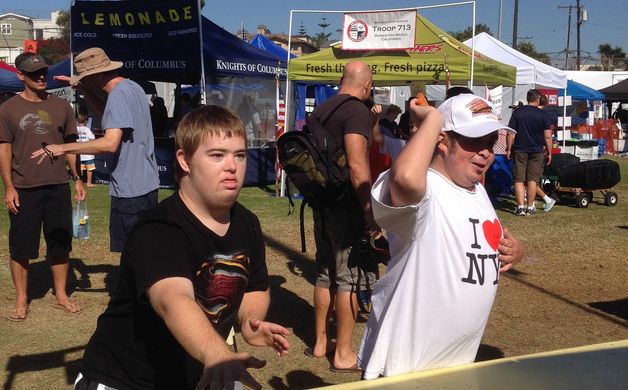 Steven King and Aren Daye take some throws at a fair game booth. Photo by Michael King. 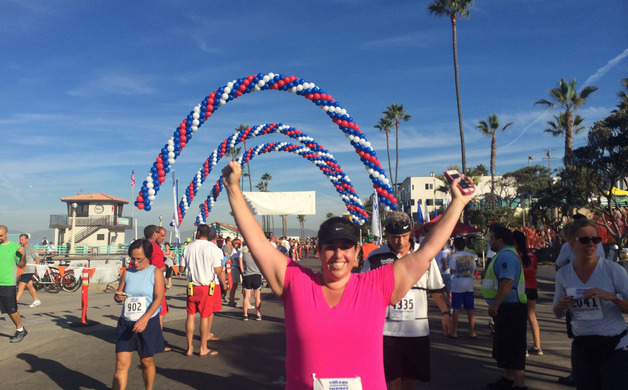 Stephanie Janicks of Hermosa Beach at the finish line of the Manhattan Beach 10K Run. Photo by Carol Ecker. Thanks again to everyone who participated, helped out, spread the word and looked at all of these wonderful submissions and winners! Special thanks again to our prize donors and to our judges, Jefferson Graham, Amy Howorth and Kris Mackerer D'Errico.